Canada currently attracts 25 per cent of all Irish investment abroad and around 60 Irish businesses have a presence there. THE PRIME MINISTER of Canada, Stephen Harper, began his two day visit to Ireland yesterday in advance of the G8 summit in Enniskillen. The principle event of his programme is a bilateral meeting with the Taoiseach, Enda Kenny this evening at Farmleigh House in Dublin. 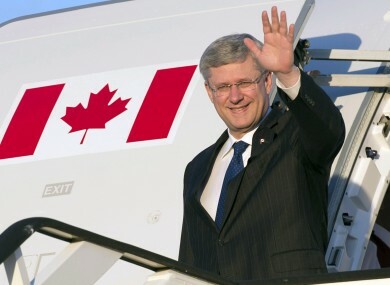 Harper is also accompanied on the visit by the Canadian Finance Minister, Jim Flaherty. Discussions are expected to focus on opportunities for trade and investment including the early completion of the EU-Canada Trade Agreement. The Government has designated Canada as one of its priority growth markets and exports have been rising steadily, reaching €780 million in 2012. Canada currently attracts 25 per cent of all Irish investment abroad and around 60 Irish businesses have a presence in Canada, employing over 6,000 people there. Email “Taoiseach to discuss trade opportunities with Canadian Prime Minister in Dublin”. Feedback on “Taoiseach to discuss trade opportunities with Canadian Prime Minister in Dublin”.